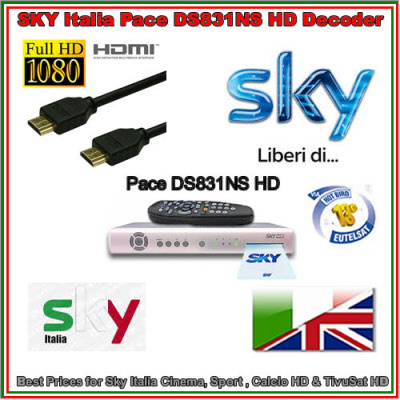 The Sky Italia Pace DS831NS HD Decoder is ideal for new or existing clients looking for a replacement HD decoder or as a substitute for the existing set up. High Definition Technology for the home Chosen by SKY Italia to launch high definition television in Italy, the Pace HD Decoder combines DVB-S2 demodulation with a H.264 decoder to enable the highest possible quality audio and video at highly efficient bit rates. standard definition content can be simultaneously output to a second TV or VCR using the SCART outputs. With support for MPEG-2, as well as H.264, the Sky Italia HD Decoder also delivers superior quality SD content – an important consideration when viewing on an HD-Ready screen. Note that to receive the HD channels your SKY Italia card must be enabled for HD.